A montage photo of President Bashir and US president Donald Trump. The United States says that it supports the right of the Sudanese people to gather peaceably to voice their demands for political and economic reform and a more peaceful and inclusive Sudan. WASHINGTON D.C., United States of America – The United States government has raised concerns about the increasing number of arrests and detentions, as well as the escalating number of people injured and killed, following four weeks of protests across Sudan. In a statement issued on Thursday morning, United States condemned the use of violence by the Sudanese security forces, including the use of live fire, and the excessive use of tear gas. The US in statement says it supports the right of the Sudanese people to gather peaceably to voice their demands for political and economic reform and a more peaceful and inclusive Sudan. 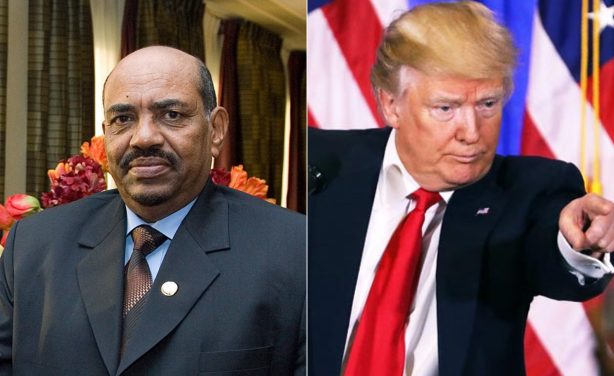 “A new, more positive relationship between the United States and Sudan requires meaningful political reform and clear, sustained progress on respect for human rights,” reads their statement. US has also urged the Sudanese government to release all journalists, activists, and peaceful protesters who have been arbitrarily detained, and to allow those facing charges full access to legal representation and the opportunity to seek legal review of their detention. “We also call on the government to allow for a credible and independent investigation into the deaths and injuries of protesters. US has told President Bashir that to address the legitimate grievances of the population, the government must create a safe and secure environment for public expression and dialogue with the opposition and civil society in a more inclusive political process. This comes a time when Sudan’s state prosecution had issued arrest warrants for 38 journalists and activists on charges of “incitement” and spreading “false news” that’s allegedly stirring or fuelling anger in the country with several demonstrations. Protests about Sudan’s economic problems began in December but have since morphed into anger at President Omar al-Bashir’s 30-year rule.